We all know about quinoa, right? The amazing grain that’s not really a grain but a seed. It’s ancient, originated in Peru, and is a complete protein. It shows up on all kinds of lists as a “super food”. And there you have it. The extent of my knowledge about quinoa except for one last thing. It’s delicious. Not in dip-your-spoon-in-and-take-a-big-mouthful way like, say, chocolate sauce. (Not that I would know anything about that.) All by it’s lonesome, it’s kind of plain. But it absorbs flavors like a pro and is equally at home in lots of different kinds of cuisines. It also has a delightful texture – soft with just the slightest crunch. This salad is pretty healthy but even if you are not the healthy food loving type, it’s a good one to have in your arsenal. I love having go-to salads like this for things like potlucks and barbecues. It’s vegan and wheat free so just about anyone can eat it. It doesn’t have to be refrigerated and it can be made in advance. The flavors are crowd pleasers – lots of cumin, garlic, and smoked paprika – not to mention grilled zucchini and my beloved chickpeas. If you wanted to add dairy, I think feta cheese or a soft goat cheese would be delicious. Or even crumbles of ricotta salata for something a little different. I cut this out of a magazine but I don’t recognize the font. Since I get Bon Appetit, Gourmet, and Food and Wine, I can assure it’s from one of those. Quinoa generally needs to be rinsed before using so it is not bitter. If you buy Bob’s Red Mill brand, it does not need to rinsed. Combine chickpeas and lemon juice in a large bowl. Add 3 tbsp. oil; pressin garlic and stir to combine. Let marinate at least 15 minutes and up to 2 hours. Heat 1 tbsp. oil in medium saucepan over medium-high heat. Add cumin seeds, 1/2 tsp. tumeric, and 1/2 tsp paprika; stir until fragrant, about 1 minute. Add 2 cups water, quinoa, and coarse salt; bring to simmer, sirring occasionally. Reduce heat to medium-low. Cover and simmer until all water is absorbed, about 20 minutes. Love love love quinoa. And for me quinoa and chickpeas together is like food heaven. I would love to eat at your house! Delicious and healthy seeds indeed! Love the addition of chickpeas in there. Loving this Quinoa I have to say. I haven’t used the seed that much, but you are right, it does absorb flavors a treat. The smoked paprika in here sounds fabulous. Mmm I love quinoa and this salad sounds like a great use of it! I’m saving the recipe. Dana, I have never made quinoa, but I like this salad. I have done farro, freekeh and lentils this month, and my husband has hated them all! He is such a carnivore, however, there is another eater in the house who likes healthy grains, that would be me! I am trying your salad. I’ll be having a healthy scoopful of this one by nightfall. I just happen to have all of the ingredients on hand. Yeah! Thanks for sharing. I love the photo. 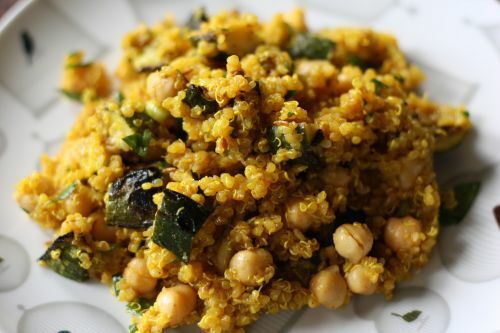 This recipe looks great – I love quinoa. I recently tried red quinoa, which I hadn’t known existed, and it was good, too. I tasted this salad last Saturday and can not stop reliving the experience in my mind. Delicious! I’m off to buy zukes now! Perfect! Just the recipe I’ve been needing. My niece is gluten intolerant, and I’ve been needing more yummy recipes for her. I love all the flavors in this, and also adore chickpeas (or as the boys say “banzo beans”). Can’t wait to make it…have everything but the paprika on hand, but it sounds like that is an important flavor, so I’ll wait until I get to the market for that. This looks so fantastic. 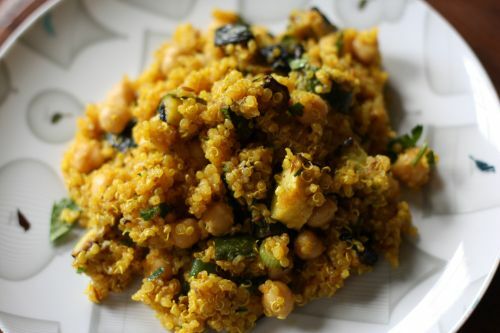 I love the combination of quinoa and chickpeas…and then to add cumin and turmeric–sounds and looks delicious! Oh, yum. I made this tonight and it was so delicious– thanks for sharing! This was my first attempt at making quinoa and it turned out great. Thanks for inspiring me! This is my kind of quinoa salad! It makes a great breakfast. I made this salad for my son’s end-of-year preschool picnic. It was a big hit, everyone gobbled it up, and I loved not worrying whether I was going to inadvertently poison anyone with a mayo-based dressing. My dork moment in making the salad: when you said “press in the garlic” into the marinating chickpeas I thought you meant, you know, push them in there, firmly, while still whole. Not press as in use a garlic press. I just couldn’t figure out how the garlic flavor was going to get in there. After more mental gymnastics than I care to admit, I finally got that I was supposed to use a garlic press. Perhaps I shouldn’t be admitting this. Looks like a Lebanese dish we make with bulgur. I can’t wait to try quinoa. Oh My Goodness!!! That has all the perfect ingredients for the best taste and texture. You go chef!!!!! I came across this recipe because all i had to work with for dinner tonight was chickpeas and zucchini. I only had half a cup of quinoa, so I used some millet to make up the difference. WOW this was tasty. What a delicious cheap to make meal! Thanks! I needed a recipe for Quinoa and I knew you would have a great one. I just made this for the 4th of July and cannot wait to serve it. This is such a yummy salad! Thanks!